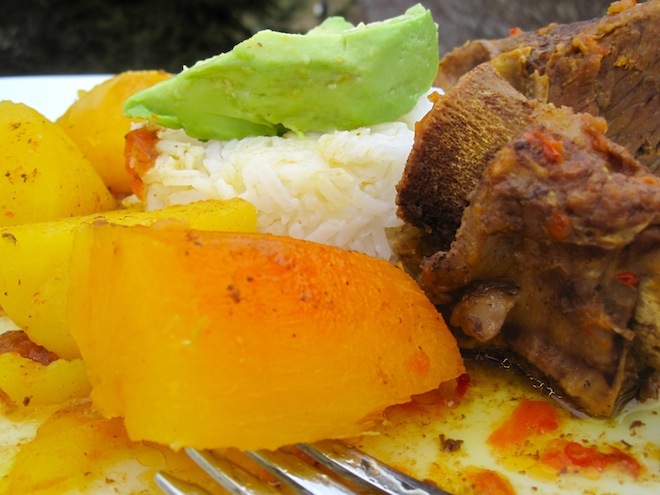 People always ask me how I would describe Colombian food, and my answer is always that the cuisine in Colombia varies from region to region. Each region has its own culinary traditions and is influenced by its regional agriculture, climate and the neighboring countries. 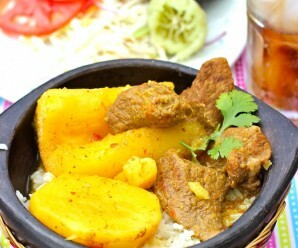 However, we do have some dishes that are popular all over the country, and every region has it own variation of that particular dish, and Sudado is one of those dishes. 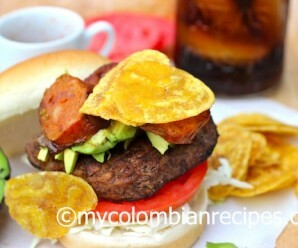 Generally speaking though, we Colombians love hearty, filling and comforting meals, with lots of meat and vegetables. 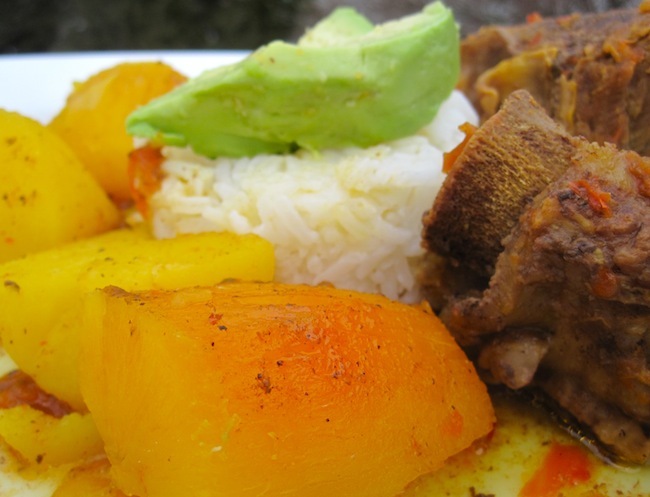 Some of the most popular vegetables in the country are corn, cassava, plantains and potatoes. Peas, green beans, and carrots are also used often in our homes, while rice and beans are among the most popular sides in a Colombian meal. I hope you enjoy this traditional Colombian meal as much as I do. Buen provecho! Season the short ribs with salt and pepper. Add some olive oil to a large pot over high heat. Add the short ribs to the pot and brown for about 2 minutes per side. While the short ribs are browning, place the onions, garlic, scallions and red bell pepper in the food processor. When the short ribs are brown on all sides, add the onion mixture, cumin, achiote, bay leaves and hogao. Stir well and cook for 5 minutes more. Add the beef broth and water. Cover the pan and reduce the heat to medium-low and cook for about 3 hours. Check often during the cooking process and add more water, if necessary. dd the potatoes and yuca. Cook for about 30 minutes more. Add the fresh cilantro and serve with white rice on the side. Follow step 1 and 2 of using a regular pot. Transfer the short ribs to the slow cooker. Add the onion mixture, cumin, achiote, bay leaves and hogao. Stir well and cook for 5 minutes more. Add the beef broth. Cover and cook on HIGH for 6 hours. 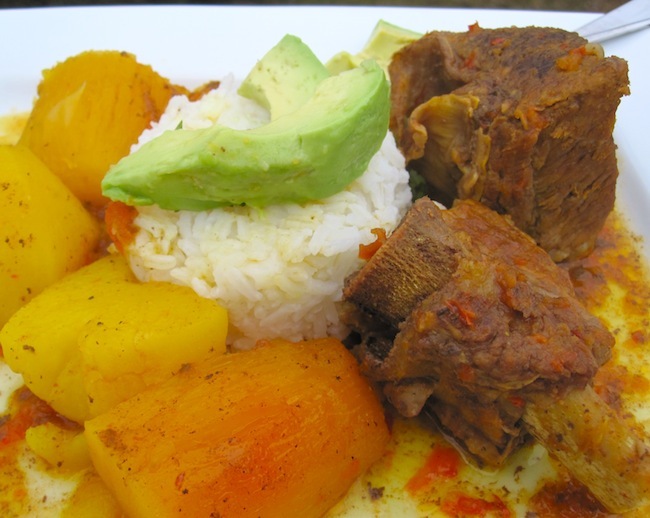 About one hour before the dish is done, add the potatoes and yuca. Add the fresh cilantro and serve with white rice on the side. That creole sauce sounds great! Bet it packs in some great heat….. 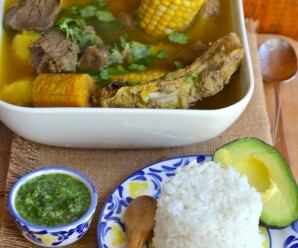 I love the warm, welcoming look of this and like the idea of making the stew with short ribs as a base. I’s so rich and nuanced. 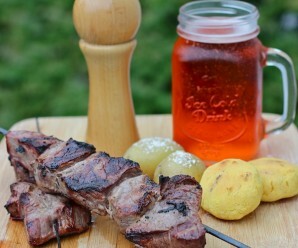 Looks like a very hearty, comforting meal! So full of flavor and warmth. I can see why this would be a favorite across all regions. I made your recipe two days ago and it is wonderful. I used the slow cooker and it was very easy. Made this the other night.It was fantastic! Thanks for the recipes!